The Fourth Industrial Revolution has seen many sweeping changes in the way we interact with one another. This interaction is not limited to human-to-human relationships but is extended to the way we deal with finances; with the idea of digitalising purchases and transactions now a reality. Mobile wallets are part of this reality, with users able to carry out purchases through cashless means, and as the term suggests, with the use of a smartphone. The Southeast Asian region has seen a rise in cashless transactions, with fiat money now reduced as the second option when paying for goods and services across the region. According to the British Chamber of Commerce Singapore, nearly 75 percent of Asian consumers use a smartphone, with a significant proportion from that percentage using their smartphones to pay for goods and services. The Philippines and Thailand are examples of countries in ASEAN that are adapting well to the use of mobile wallets. According to Reciprocus International, the value of card payment transactions in these two countries is projected to grow at a Compound Annual Growth Rate (CAGR) of 15.2 percent and 8.1 percent over the next 5 years to reach a value of US$91.9 billion and US$82.7 billion respectively, in 2021. In Malaysia, going from paper-based to electronic payments could help the country save as much as one percent of its GDP. “For mobile payments to be successful, one needs a combination of factors, including interest and eagerness from customers to use mobile as a device to pay, and a broad merchant network,” said Zafrul Aziz, CIMB Group Holdings Bhd Group CEO. The positives of using mobile wallets are many. Mobile wallets are convenient due to the fact that a customer does not have to carry his or her physical wallets around. With just a scan of a smartphone, a transaction can take place. Services like Apple Pay allows users to add multiple cards to their smartphones, theoretically giving them the option to leave overstuffed wallets and purses at home. Also, the temptation to spend can be reduced if a person is separated from tangible cash. Furthermore, time spent at the counter can be reduced as well, given the speed at which transactions can take place by means of a tap of the smartphone. It is perhaps surprising to many, but contactless payment services can offer more security than traditional card usage. “You never have to take out your credit card or debit card, so there’s a lot less chance of someone seeing it,” said Jason Chaikin, President of Vkansee, a biometrics security company. “Every transaction (mobile wallets) creates a random, one-time number – a transaction token – and even if someone was able to know that number, it’s not valid later,” Chaikin added. This one-off number can be compared to a Personal Unlocking Key (PUK) code for individual SIM cards. Samsung Pay, Android Pay, and Apple Pay all use this process which is known as tokenisation. Although your banking card is loaded into a payment app, the actual card number is not shared with the merchant who is on the receiving end of a specific transaction. Rather, a temporary code is issued in its place. This method is similar to the way EMV chip cards work. EMV credit and debit cards have chips that create a cryptogram (unique code) when inserted into a merchant’s payment terminal. However, the card is in view while the terminal reads the chip. 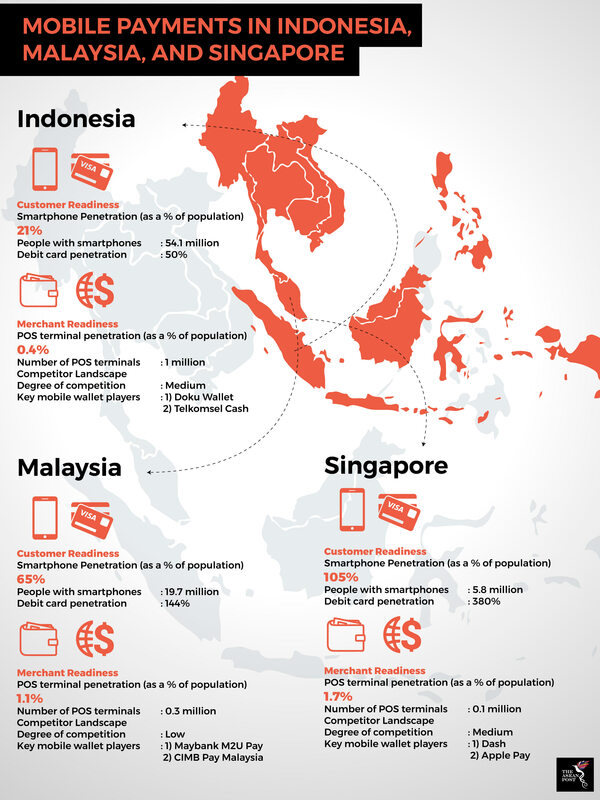 In general, the ASEAN region is acceptive of mobile wallets. The initial concerns of safety and security through the use of mobile wallets have now been quelled by means of tokenisation processes utilised by service providers to protect consumers’ information during transactions. In the near future, smart wallets are set to become commonplace in most ASEAN countries as the bloc moves towards embracing new technologies in line with the Fourth Industrial Revolution.